Successfully Added 2GB MP4 Player - 2.4 Inch LCD Screen + SD Card Slot to your Shopping Cart. 2GB MP4 Player with a 2.4 inch TFT LCD screen and SD memory card slot. Don't let the budget price on this unit fool you, this is a very good MP3 / MP4 portable multi media player. With a nice 2.4" LCD, 2 GB's of internal memory plus an SD card slot for expansion, this unit is very capable of keeping you highly entertained. Whats more, this unit also has a built-in digital picture and video camera function, allowing you to capture any memorable scenes while you are out and about. If all that wasn't enough, it also comes with an NES video game emulator and PIM software tools such as calendar and calculator to help you get daily usage out of your new pocket media player. 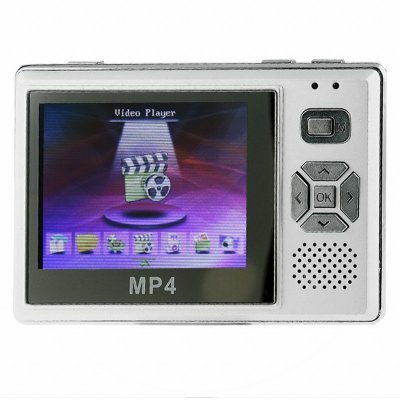 This MP4 player is available right now at a great wholesale prices with no M.O.Q. (no minimum order quantity) from Chinavasion. MP4 / MP3 portable digital media player with 2.4 inch TFT LCD view screen and color icon menu system. Unique digital media player also includes picture and video camera (with SD card slot) functions. When you are not listening to music or watching videos, then you can use it to play games. on 2008-12-07 05:20:07 the best ever! i got this mp4 player as a gift for my birthday. it's awesome! (O melhor MP4 (mp5) que já vi, grava em otima qualidade os videos.) Otimo produto para revenda. I love Chinavasion products but the shipping takes a bit too long if this is improved this company would go places. I recomend Chinavasion because of good quality products and beautiful packaging, my customer love the professional look of the boxes and the fact that the mauals are easy to read. I would like to know if Chinavasion would allow me to use their product photos on my website to promote their products? This product looks very good. I have bought one of this of one reseller in Brazil. I am waiting its arrived. In future, I´d like to be a reseller of this company's products. looks like a very good deal. me be compation for ipod.